In case you’ve missed it, The Master’s Seminary has been doing an extended series of short videos outlining its key doctrinal distinctives and commitments. Topics have included commitments to the holiness and glory of God, 6-day creation, the inspiration and authority of Scripture, and the premillennial return of Christ. That series is continuing this week with key points of the doctrine of salvation, including man’s need, God’s plan of election, Christ’s atonement, and so on. You can find all of the videos (and more to come) at this link. I had the privilege of giving voice to the Seminary’s commitment to the heart of the Gospel: redemption accomplished through the atonement of Christ. As an added bonus for the Cripplegate readers, I thought I’d publish the notes I prepared for the video. As can be expected, I had prepared more than made the final cut (my “gift” of long-windedness strikes again), so I thought this would be a good place to present the “excess fruit” of my preparation. I hope it’s a blessing to you. This means that the cross is not merely an example for us to show us how to live, though it is that. It’s not merely a demonstration of God’s love for humanity, though it is that. Most fundamentally, the cross is the innocent Son of God, standing in the place of guilty sinners, bearing in His own Person the full exercise of the righteous wrath of His Father against the sins of His people. You see, our sins justly earned us the penalty of hell—of consummate spiritual death, of eternal punishment. And because God is a holy and just God, He must punish sin. God can’t simply sweep our sin under the rug and say, “Well, kids are going to be kids!” No, if God is holy, righteous, and good, sin must be paid for. The problem is: hell is a penalty that none of us can ever pay. No one can survive an eternity of God’s judgment. But on that cross 2,000 years ago, God the Son stood in my place, and experienced the unmixed fury of hell itself, due to me because of my sin, and rose from the grave on the third day. Every ounce of the wrath of God against my sin—the wrath that I was sure to experience in hell—was fully satisfied, because it was fully borne by my Substitute. And so—praise God!—there is no wrath left for me! This is what the Bible calls propitiation, borrowing from the language of Old Testament sacrifice. On the Day of Atonement in Israel, the high priest would sprinkle the sacrificial blood on the mercy seat in the holy of holies. And through that blood, God’s wrath against Israel’s sin would be satisfied, appeased. In the same way, the New Testament speaks of the Lord Jesus Christ as our High Priest, who sprinkles His own blood on the mercy seat of God’s heavenly altar, such that God’s wrath is propitiated against His people. Most fundamentally, the cross is the innocent Son of God, standing in the place of guilty sinners, bearing in His own Person the full exercise of the righteous wrath of His Father against the sins of His people, so that we who are guilty may be justly declared righteous. And so Scripture speaks of Christ as the Passover Lamb of Exodus 12, who has been sacrificed in our place (cf. 1 Cor 5:7). 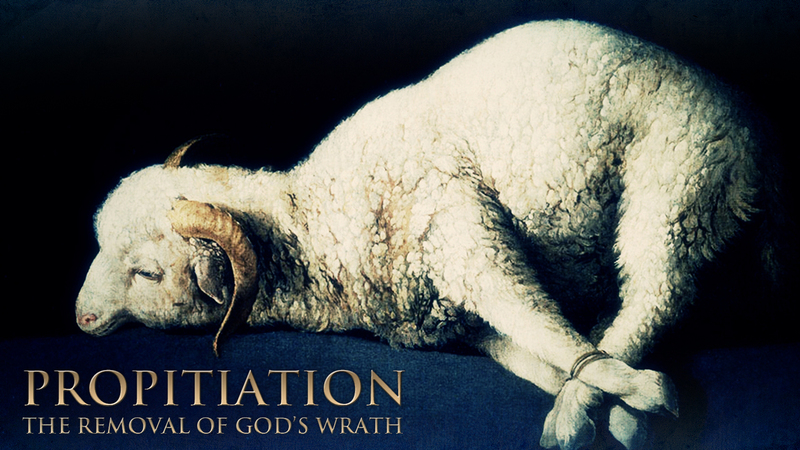 He is the Scapegoat of Leviticus 16, who bears the sins of God’s people and is banished from God’s presence (Lev 16:10). He is the Suffering Servant of Isaiah 53, who justifies the many by bearing their iniquities (Isa 53:11). Galatians 3:13 tells us that Christ redeemed us from the curse of the law by becoming a curse for us. Mark 10:45: The Son of Man came to give His life as a ransom for many. Scripture is just shot through with imagery of penal substitutionary atonement! And that is because it is the very foundation of the Gospel itself. And so on the cross, Christ paid the penalty for the sins of His people, bearing the fullness of the Father’s wrath against them, and thereby purchasing a people for His own possession. And when that wrath was satisfied, Jesus cried out in triumph, “It is finished!” (John 19:30). In that moment, the work that the Father had given Him to do was completed. Redemption had been accomplished. The salvation of all those whom the Father had given to the Son (cf. John 6:37, 39; 17:9, 11, 24) was infallibly secured 2,000 years ago on Golgotha. And Jesus will lose none that the Father has given Him, but He will raise them up on the last day (John 6:39). You see, this was not a nameless, faceless, potential atonement, whose benefits have to be activated by the sinner’s will. This is a particular, efficacious, actual atonement—sovereignly accomplished by the Son—the benefits of which are enjoyed by all whom the Father chose and whom the Spirit regenerates. Redemption is a divine work from beginning to end. We can sum it all up this way: On the cross, the Father treated Jesus as if He lived my life of sin, and punished my sin in Him. And because He did, He can now treat me as if I lived Jesus’ life of righteousness, and receive me—a sinner!—into His holy presence to enjoy fellowship with Him. And this He does for everyone who repents of their sins, and trusts in Christ alone for righteousness. But we can’t end without saying this: An accurate theology of the atonement must lead to a transcendent doxology for the atonement. If all of what I just spoke about is just an academic exercise, or just intellectual jousting—if these truths don’t bow you down in worship—you’ve missed the entire point of theology. Satan has an excellent theology of the atonement. The demons believe and shudder, James 2:19. The difference is: they are not beneficiaries of Christ’s atonement. But we His people are beneficiaries. And so we study not as dispassionate theorists, but as blood-bought, redeemed sinners. TMS aims to train our future pastors to do theology as worshipers, and not merely as analysts. Theology must lead to doxology. Analysis must lead to adoration. This entry was posted in Redemption, The Gospel. Bookmark the permalink.